On Tuesday (Aug. 15) evening at 5pm local time, millions of households and businesses across Taiwan suddenly went dark. For some, phone lines and TVs went dead for a few hours. For others, entire production lines came to a halt. Taiwan’s state-backed power monopoly Taipower said that the blackout was caused by human error. But it’s nevertheless flagging an important issue for the country—unless it reforms its current pattern of energy consumption, it’s on track to face a major crisis. 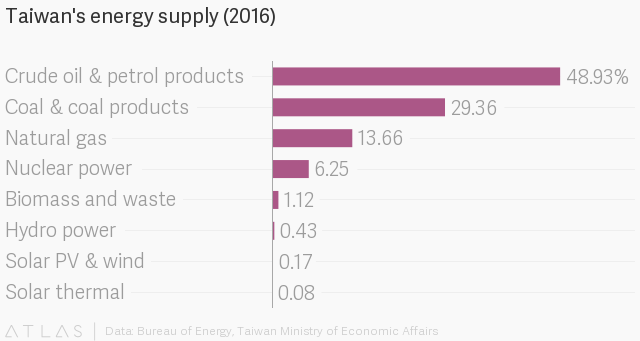 Like Japan and Korea, Taiwan has a dearth of indigenous energy sources. As a result, it imports over 98% of its energy, mostly in the form of fossil fuels, according to the government. Meanwhile, 6.25% of Taiwan’s power supply comes from the island’s three nuclear power plants, which began construction over 30 years ago. It’s a mix that’s less than optimal—relying on imports is expensive and risky, especially given Taiwan’s isolated geopolitical status and China’s influence on energy prices. Meanwhile, energy supplies are already low—since January, Taipower had been warning that operating energy reserves would fall below the standard 6%, and one week before the blackout, it issued a “red alert” warning that they were nearing 1% due to a heatwave on the island that drove up electricity usage. Taiwan’s power infrastructure is also woefully out of date—it’s ill-equipped to endure the regular storms that hit the island, and not capable of accommodating a drastic shift to renewable energy. 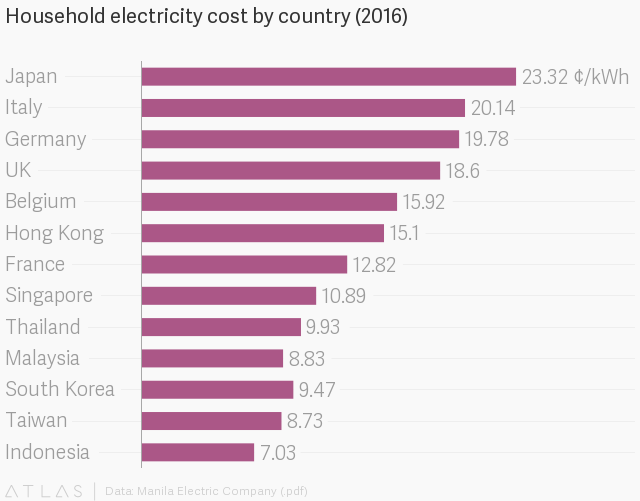 That’s in part because Taiwan’s household electricity prices are set by the state, such that Taiwan has some of world’s lowest electricity costs for consumers—well below developed Asian peers like Japan, South Korea, and Singapore. Taipower currently operates at a deficit. That, coupled with regular consumer and political blowback whenever price increases are floated, makes upgrading the island’s power infrastructure more difficult. While Tuesday’s blackout only lasted five hours, a larger one is within the realm of possibility. It could have potentially devastating effects for an economy that is heavily dependent on manufacturing and critical to the world’s technology supply chain—Taiwan is home to industrial giants like TSMC, one of the world’s largest contract chipmakers. TSMC, a major supplier to Apple, said its operations were not affected this time. One solution is to invest in more nuclear power. Yet that’s anathema to the current government. In 2014, a wave of anti-nuclear protests led the government to halt construction of a new nuclear power plant. Such anti-nuclear sentiment is not without merit—Taiwan is an island prone to earthquakes and typhoons, and memories of the nuclear meltdown in Japan in 2011 loom large. Current president Tsai Ing-wen, who came to power in 2016, ran on a staunch anti-nuclear platform. Since taking office, she’s reduced the island’s existing supply of nuclear energy by 13%, according to government figures. Tsai has also pledged to raise the share of renewable energy of Taiwan’s power supply to 20% by 2025. But that will require upgrading Taiwan’s grid, which currently isn’t built for wind and solar power. Upgrading that grid will cost money—which will come either in the form of higher taxes, or higher electricity prices. And even then, the addition of renewables might not compensate for the rollback of nuclear energy. “It’s very difficult to envision that the capacity in renewable, whether it’s onshore wind or offshore wind or solar, could in any way make up for what is lost if nuclear is de-commissioned in its entirety,” says Ross Feingold, a consultant who advises multinational clients on legal and political risk in Taiwan. Taiwan’s economic affairs minister resigned after the blackout, and Tsai published an apology on Facebook (link in Chinese), vowing to overhaul Taiwan’s “extremely weak” power system. But she also renewed her commitment to renewable energy, and Taiwan’s premier Lin Chuan also reiterated that (link in Chinese) restarting nuclear power was not a “logical” solution to what he said was a “short-term power outage.” Until Taiwan chooses and commits to a path—nuclear, or renewables, or both, with a power grid upgrade—these “short-term” outages could become long-term recurrences.